Hours may vary. Please make an appointment before planning a visit. 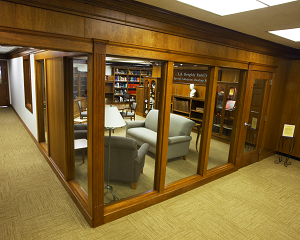 The collection functions as an archival and historical repository and research center. Items which represent the heritage of The United Methodist Church in Ohio from its inception up to and including the present day will be selected. Primary emphasis is on the East and West Ohio Conferences with other materials maintained from antecedent conferences. The Archives of Ohio United Methodism is a rich resource for researching church history, clergy members, and genealogy. The Archives does offer research services to those interested in any of these areas. You can submit a request to the archivist with the details of your research needs. The Archives of Ohio United Methodism is a collection of books, manuscripts, pamphlets, periodicals, artifacts, and other materials organized to encourage the study of the history of United Methodism in Ohio. The Archives is housed at Beeghly Library, Ohio Wesleyan University and is jointly sponsored and supported by the University and the East and West Ohio Conferences of The United Methodist Church. Our Shared History: Delaware, Methodism, and Ohio Wesleyan University is a collaborative project between Ohio Wesleyan University and the Delaware County Historical Society. See the United Methodist Historical Society of Ohio website for direct access to online histories of United Methodism in Ohio.